“The Med” an impatient acquaintance of mine once remarked “really is quite dead.” The remark was made during that very forgettable post-Beach period when everyone I knew was stampeding in the general direction of Thai Air; backpacks, boarding passes and bonhomie. Chums were desperate to corner a piece of the ‘Thailand action’; “It’s cheaper than Italy” chirped an optimistic friend; “The beaches are so perfect!” cooed another. Both remarks were arguably valid; it was cheaper than Italy and the beaches were the paradigm examples of how beaches should be. However, that has changed – largely due to the explosion in tourism. To clothe yourself for such a trip requires little thought; large quantities of shorts, casual short sleeved shirts and polo shirts. The ‘look’ was that of a student cast adrift; a wanderer and amateur philosopher. This look even affected some of the hardy Meddites – those who clutched their cool cocktails on the Costa del Sol or the Riviera – whose holiday wardrobes seemed to belong among the palms and the temples of South East Asia. It was, and still is, an awkward sight; the juxtaposition of two contrasting world destinations, and indeed it would be equally jarring to see linen trouser chic and nautical flavours at Koh Samui. The question I am pondering is; is style geographically transferrable? History has a good number of representatives of the chameleonic school of style; Byron on his travels East, Mark Anthony on his sojourns to Egypt and TE Lawrence in his Arabian element. On the Grand Tour it was not considered out of the ordinary for wealthy travellers to adopt the local dress and style of the nation in which they were residing; the image that all wealthy Europeans stomped around the ancient palaces and ruins of Europe in Parisian fashions and London tailoring is slightly inaccurate – adopting certain modes and peculiarities of dress was part of the entertainment of travelling. In these post-colonial days, the concept of dressing so frivolously ‘for the occasion’ is very much outdated. Even men who consider themselves to be conscientious both sartorially and culturally are likely to adopt only a few fashions of a local flavour. Many observers might also consider that the internationalisation of fashion has led to the establishment of a ‘world fashion’; where gentlemen of all nationalities might adopt very similar ensembles for different localities and different purposes – this is, of course, the inevitability of improved communication. 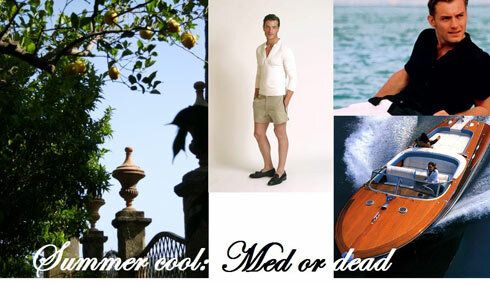 If I were travelling in Europe, or beyond, for the summer season I would be attempting what has been considered a ‘Mediterranean style’; soft, light coloured shoes, linens, cotton shirts; cliché casual chic, a la Dickie Greenleaf from The Talented Mr Ripley. It’s comfortable and really rather adaptable. And specifically, it is transferrable. The Mediterranean style is not homogenous or dull; it looks altogether organic and fresh but it is certainly less conspicuous than some of the more ‘dandy’ and historic summer styles that, while often beautiful and striking, really do belong on the creaking boulevards and in the faded glory of Old Europe.